SHORTBOX, a collection of comics curated and published by Zainab Akhtar, has announced that you can pre-order the newest releases until April 27th, with a scheduled shipping date in June. Akhtar has an eye for great comics, and her boxes have always had works that have challenged me as a reader, opened my eyes to creators I might never have otherwise come across, impressed me with their quality and diversity. If you are a fan of independent comics, you should be investing in what ShortBox is offering every three months. 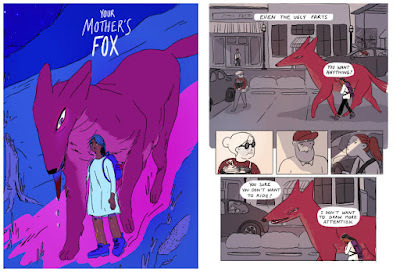 'Your Mother's Fox' by Niv Sekar 36pp, colour. giant fox may be better than any car for a roadtrip, the fox is old, and America is its own land. A thoughtful and poignant treatise on place, identity, and belonging. The River Bank by George Mager, colour, 40pp, french flap cover. George Mager brings his uniquely charming whimsy to this long-term passion project: an adaptation of Kenneth Grahame's classic, The Wind in the Willows. Follow Mole, Rat, Toad, and Badger in an exuberantly lively and fresh journey, that will have you ready for the joys of spring. 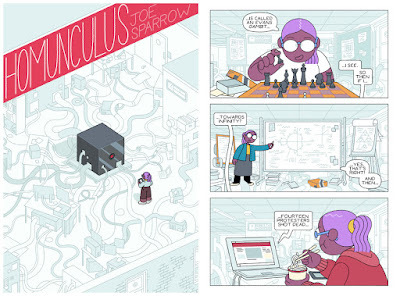 Homunculus by Joe Sparrow, 70pp, colour. A machine at the end of the world... In the near future, a young scientist and her sentient creation struggle to understand, and be understood by, the world around them. A story about love and learning, death and time, told across the years. 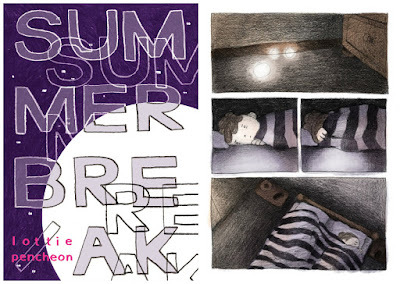 Summer Break by Lottie Pencheon 90pp colour, perfect bound, spot gloss cover. Lottie's been feeling ill, or 'off' at the least, the difficulty of articulating exactly what's wrong leaving her even more isolated within herself. A break away with her family in the crisp, green goodness of nature seems like it could shake off any cobwebs, but it becomes apparent that what she's facing is very real, and that there's no quick fix. 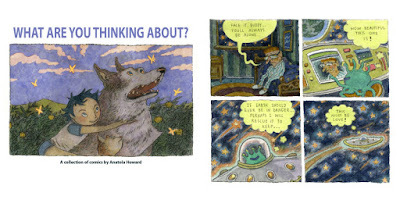 What Are You Thinking About by Anatola Howard, 32pp colour and black and white. A collection of stream-of-consciousness vignettes and short stories from one of the most exciting up and coming cartoonists in North America. Spring 2018 Box from UNCIVILIZED BOOKS!